A call to Yachtzoo in Monaco brings news that they've signed the 54.4m motor yacht Faribana V for sale in a joint listing with Merle Wood at Merle Wood & Associates. Built to Lloyds class in 1998 by Amels to an Andrew Winch design, Faribana V recently had a total interior refurbishment and a fresh exterior paint job. She boasts seven luxurious staterooms served by a large elevator and twin 1650hp Caterpillar engines give her a cruising speed of 14 knots. 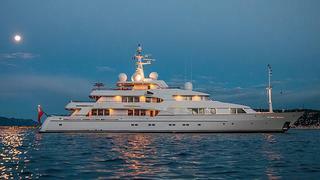 On display at this week's Monaco Yacht Show, Faribana V is asking $37.5 million.